It has taken a few years, but now there is research showing that slow-release nitrogen can benefit Canada’s potato growers on several fronts. Sulphur and various polymer coatings for urea granules now have several applications, worldwide. In China and Southeast Asia, for instance, farmers are gaining access to slow-release, coated fertilizers. Agrium Inc. introduced its product first for the American corn belt in January 2004. Marketed as ESN (Environmentally Smart Nitrogen) through Agrium Advanced Technologies, the product is guaranteed to contain 43 percent nitrogen. The semi-permeable coating allows water to diffuse through and slowly dissolve the urea granule. The release rate is controlled by soil temperature and moisture supply. Production has quickly expanded. Agrium upgraded its facility at Carseland, Alberta, in February 2006 to a 150,000-tonne capacity. The Carseland site also produces conventional nitrogen products and a controlled-release fertilizer for specialty applications. In 2010, Agrium completed construction of a second ESN facility, with a 120,000-ton capacity, at New Madrid, Missouri. Canada’s potato industry became seriously interested about ESN in spring 2006 after the Canadian Food Inspection Agency approved ESN as a nitrogen source for potatoes. That year, in fact, a preliminary study with potatoes looked promising. Potato industry funding for research had been held back until there was confidence they would be able to use the product, says Dr. Michele Konschuh, potato research scientist with Alberta Agriculture and Rural Development (AARD) in Brooks. A three-year formal research study began in 2007 in Alberta at the Crop Diversification Centre South in Brooks, and at Vauxhall, at a substation of the federal Lethbridge Research Station. Results were announced in 2010. Funding came from Agrium, AARD, the Potato Growers of Alberta and the Agriculture and Food Council of Alberta. “Our research showed that you can use it; that there are some good reasons, some good applications, for doing so,” Konschuh says. “We recommend ESN with caution. ESN may be a better fit for Manitoba, she notes. Compared to Alberta soils, Manitoba soils warm up faster and often have excess moisture. The polymer should enable earlier transfer of nitrogen to the seedling crop while reducing losses due to leaching. Two rotations in the Maritimes are showing growers benefit with two to five more tonnes per hectare (0.9 to 2.2 tons per acre) from the ESN pre-planting treatment. “It definitely allows the grower to put all of the fertilizer on ahead of planting. He saves the time and labour and expense of going out in-season while managing to get as much or more potato. It’s working well,” Dowbenko says. 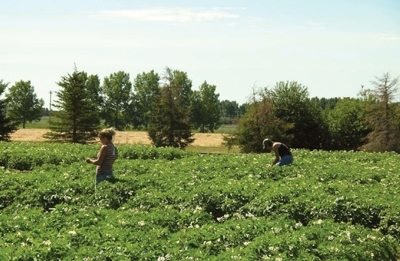 Agrium retailers at Portage la Prairie, Manitoba, have tried producing shorter-season potato varieties with blends of ESN and urea pre-plant. According to Dowbenko, results to date have been favourable. The Alberta potato study with ESN is posted online at www.smartnitrogen.com and at www.agric.gov.ab.ca.